Turn Key - No Cost To You!! 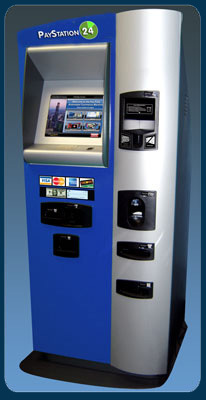 Bill Payment Kiosks: Our bill payment kiosk allows your customers the convenience of being able to pay their bills from your location. Your customers can pay bills they have with over 110,000 companies that are currently registered within the bill payment system. Pay bills such as utility payments, cell-phone payments, credit cards, insurance payments, home loans and many more. You can add additional revenue to your location by utilizing the optional digital signage monitor and sell pre-paid phone cards all from the same bill payment kiosk. Offer your customers the ability to pay their bills at your location with the new "Bill Payment Express" bill payment kiosks. Bill payment kiosks are incredibly easy to use and generate huge residual income month after month. BILL PAYMENTS TO "DIRECT NETWORK BILLERS": Payments paid to Direct network Billers will post paid with direct netwrok billers within 1-3 hours of transaction between normal business hours. BILL PAYMENTS TO "IN NETWORK BILLERS": With over 110,000 companies within our database, such as phone companies, electric companies etc. Payments paid to In Network Billers will post paid within 1-3 days of customer transaction. messages using the buttons on the bill pay interface. They may also move to a previous screen or cancel the transaction. verified, customers are prompted through animated screens to pay the bill. Bill Payment Kiosks accepts full and/or partial payments. Customers can choose various payment methods when using the Bill Payment Kiosk. When paying with cash, a customer only needs to select “Pay by Cash” and insert the currency as shown on the screen. The Bill Payment Kiosk will display an onscreen calculation of the bills inserted. The bill paying customer then selects “FINISHED” once all currency has been inserted. A receipt will be printed finalizing the transaction at the payment kiosk. Optionally, the bill payment syatem permits customers to pay a bill by credit or debit card simply by making the corresponding selection on the “Method of Payment” screen as shown in illustration no. 4. The amount to be paid must be entered using the keypad prior to inserting the card. Once the amount is entered, the customer would press “Continue” to follow the onscreen animation illustrating the inserting of the card. Customers desiring to pay a bill by check can make this selection on the “Method of Payment” screen as shown in illustration no. 5. Similar to paying a bill by card, the customer must enter the amount to be paid prior to inserting a check. A National Automated Clearing House Association (NACHA) message appears on screen notifying the customer that the bill payment will be processed via an ACH transaction. After payment has been made, the bill payment kiosk will print and dispense a receipt of the transaction. The bill pay receipt will contain detailed information such as date, time, bill pay kiosk information, transaction number, payment method as well as card authorization number and amount paid. In the event a receipt fails to print, a customer can call a toll free number to request a copy of the receipt which will be sent by mail.